Truth these days has an automatic tonal problem however it's presented, whereas every manner of deceit is music to the modern ear. I don’t’ know how it happened but we've become so fragile, so feckless. Remember when this guy was a hero of the silver screen? Today they'd lock him up for scaring all the men out of the theater. Not a nice tone at all. We've gone all Justin Bieber these days. Goodness me, what a rad-trad meanie. Terrible tone, right there! These days there are two social non-negotiables: 1) Don't smoke and 2) Don't be a meanie. You can abort your baby. You can marry your wife's brother. You can curse up a storm in a Wal-Mart. But don't speak the truth in public, because that's just mean! This has been going on for a while, of course. The secularists and God-haters called the Meanie Police on Cardinal Ratzinger before he'd left the loggia. Remember? God’s Rottweiler was mean, because he wasn't ready to shut up and bow down to the Lords of Political Correctness. Where am I going with all this? Well, we’ve been getting some unsolicited “tone coaching” over here at The Remnant this week from a few friends who don’t appreciate the fact that, out of sheer desperation, some old Trad warhorses--John Vennari, Chris Ferrara and Michael Matt--took their case against Pope Francis directly to his face. "Good statement," they patronized, "but — wait for it! — bad tone. I mean, you guys sound really mean." I think I'm as nice as the next guy, but I've yet to discover a nice way of telling someone they're going to hell, for example. It's not a nice place to go, and it's not a nice thing to say. But if it's true, it must be charitably said...even if the Meanie Police take umbrage. If a person is going to object to something these days he’s got to make absolutely certain his objection doesn’t offend anyone. Otherwise he’ll get a Tone Citation from the Meanie Police and won't be invited to cocktail parties anymore. He's permitted to register his complaint—in a nice way—but then he needs to get lost. Anything more than that and he loses credibility with the pretty people in the big time. Anyway, for me this is hopeless. In all things, Caritas, of course, but I’m just not very good at making myself seem reasonable to the unreasonable or sane to the insane or nice to the vicious. And I’m way too old to worry about making myself sound pretty to the ugly. Christ tells us to love our enemies, and I do try. But He didn’t say I have to be nice to people who are wrecking everything for which we've all sworn to die rather than deny. This is war, and I guess the question is: Are we soldiers of Jesus Christ, or merely His faint-hearted politicians? So what to do. 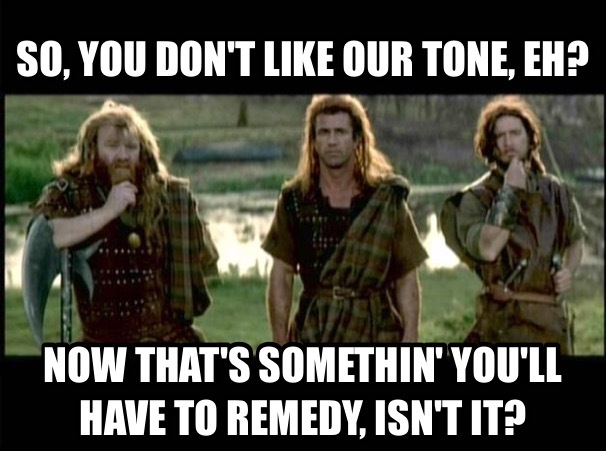 Since most of our friendly-fire critics hail from the blogosphere, I thought I'd respond in a super-duper nice way by using one of their favorite things--a meme. God bless all of our friendly critics [and that was written in a sincerely nice tone].